The conditions to be satisfied for synchronization of three phase alternators are same as that for single phase alternators. But instead of saying that voltages must act in phase opposition, the phase sequence must be same i.e. phase must be connected in proper order of R, Y, B. Typical setup for synchronization of alternators is shown in the Fig. 1. In synchronizing three phase alternators, three lamps are connected as shown in the Fig.2, so that it can be use to indicate whether the incoming machine is running slow or fast. With symmetrical connection of lamps, they would dark out or glow up simultaneously provided that phase sequence is same for incoming machine and bus bar. Step 1 : Start the prime mover of machine. Adjust its speed to a synchronous speed of machine B. This will rotate the rotor of alternator B. This will rotate the rotor of alternator B at synchronous speed. Step 2 : The switch S4 is then closed. By adjusting the rheostat Rx the excitation to the field is adjusted so that induced e.m.f. of B is equal to the induced e.m.f. of A. This can be verified by voltmeter. Step 3 : To satisfy remaining conditions, the three lamps pairs are used which are L1, L2 and L3 as shown in the Fig. 2. 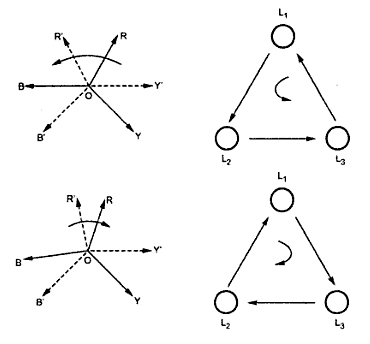 These are connected in such a way that pair L1 is straight connected while the pairs L2 and L3 are cross connected to understand the connection, the pairs are again shown in the Fig. 3. Now two supplies are supplying lamp pairs, ERYB i.e. voltage supply of bus bar while ER'Y'B' i.e. supply generated by alternator B. The switch S3 is still open. Let the three bus bar voltages be represented by phasors OR, OY, OB rotating at angular speed of ω1 rad/s. 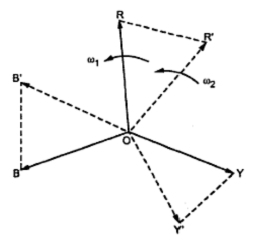 The incoming alternator voltage are represented by phasors OR', OY', OB' rotating at angular speed of ω2 rad/s. The phasor ERR', joining the tips R and R' is voltage across lamp pair L1. 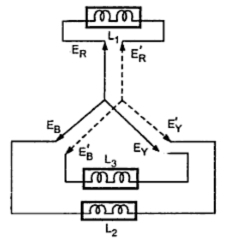 Similarly EYB , and EBY, are voltages across lamps L2 and L3 respectively. If there is difference between the two frequencies due to difference in speeds of the twp alternators, the lamps will become dark and bright in a sequence. This sequence tells whether incoming alternator frequency is less or greater than machine A. The sequence L1, L2, L3 tells that machine B is faster as the voltage star R'Y'B' will appear to rotate anticlockwise with respect to bus bar voltage RYB at a speed corresponding to difference between their frequencies shown in the Fig. 4. The sequence L3, L2, L1 tells that the machine B is slower because voltage star R'Y'B' will appear to rotate clockwise with respect to bus bar voltage RYB. The prime mover speed can be adjusted accordingly to match the frequencies. The synchronization is done at the moment when lamp L1 is in the middle of dark period. If the lamps pair becoming dark and bright simultaneously, it indicates incorrect phase sequence which can be correct by interchanging any two leads either of the incoming machine or of bus bars. Note ; For high voltage alternators it is not possible to use the lamps directly. In such cases lams are connected through potential transformers. In this method when lamp L1 is dark the other two lamp pairs L2 and L3 and equally bright. So this method of synchronization is called ''Lamps bright and dark'' method.